I’ve been leafing out my family tree for a long time and believe this is almost as much fun for me as walking along a sandy beach looking for sea shells. I love discovering hidden treasures both places. Genealogy is a fun and challenging hobby for me. It fits in nicely with my profession as a writer. I’m looking forward to sharing family history and collaborating with others researching members of my family tree. You can always reach me at: txwordweaver@yahoo.com. Looking forward to reading your comments and learning more about your own AncesTrees. 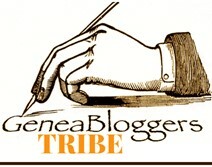 Welcome to GeneaBloggers, Debbie! I have a few surnames in my tree also; Ewing (by marriage) McGill (indirect). Looking forward to reading about your family history! Thanks for the welcome. I’m looking forward to more family tree discoveries and breaking through some brick walls. One in particular concerns our McGill branch. Alice McGill, about 1878, is my husband’s grandmother. Because she was a Cherokee Indian born in Tennessee, it has been nearly impossible to find her parents or siblings (we feel she may have taken her last name from a family she met on the way from TN to TX. So hard to go any further since her name is not on the Dawes roll. Interesting. Did this family come from or live in Tennessee or Texas? Do you suspect that they were of Indian heritage? I am not sure but, I will give a call to Denver’s widow later this afternoon, she is not in great health but remembers everything! Hopefully, I will be able to find some info for you. Very neat idea I have always want to trace the matriarchs in my family back as far as I could. Best of luck! Hi Debbie – you should check out my cousin Danny Grizzle, from Texas, on facebook. He is from the “Mormon side” of the family and is just the best story teller, researcher, documentarian, a family could have!